Summary: You feel sorry for the actors as it looks like a fairly unpleasant shoot, all pruny skin from being immersed all day long, but not as sorry as you do for the audience. You can imagine the pitch for Adrift; its Open Water, but *without* the sharks! We open with a prologue – high school buddies Amy (Pratt), Zach (Lange), Lauren (Hillis) and Dan (Dane) pledge lifelong friendship. A few years later, they gather to celebrate Zach’s birthday. Dan, who has been doing well for himself, invites them to join him on his luxury yacht. Dan is surrounded by the trappings of wealth, among them the beautiful Michelle (Richardson). Amy has similarly moved on, and turns up with husband James (Speight, Jr) and baby Sara in tow. Delighted to be together again, they are soon underway. 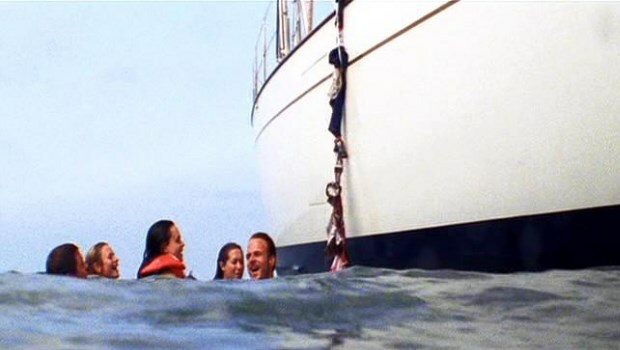 Though the others think it odd that Amy is wearing a life jacket, they are too busy toasting Zach and enjoying the ride to question her. A few hours out of port, they anchor near a spectacular reef in the open water, and as its so hot, everyone votes to swim. Amy stays on board to care for Sara, and Dan lingers to talk to her. Adrift is one of those films that you watch with a feeling of impending doom and escalating exasperation. These sort of silly accidents happen to people all the time, but in many ways the group only have themselves to blame. Amy’s presence on board a yacht seems illogical – if she has such an almighty phobia why would she agree to the trip in the first place. The other characters are equally annoying, though the worst has to be Michelle. From the minute she gets on board she’s moaning and when she starts hyperventilating and babbling the Lord’s Prayer I wished a shark would come and get her. Ironically, when she is finally dispatched its without ceremony, but the death of one of the other characters causes a massive overreaction. Of all of them the only one I felt any sympathy for was James, who clearly didn’t really want to be there. He suffers from a singularly unpleasant accident. Of course it also turns out that Dan, who is, frankly, an arse, has been less than honest with his mates, and is therefore directly responsible for them all being in this situation, but why oh why doesn’t even one of them, not even extreme sports fanatic Lauren, know the correct hand signal for being in trouble at sea? Its the first thing you learn as a surfer. And why doesn’t Amy’s life vest come with a whistle and a light, like the ones on planes? And how could the filmmakers bear to leave that poor baby screaming and screaming and screaming while their cameras rolled? In the end Adrift is gruelling and infuriating and improbable. You feel sorry for the actors as it looks like a fairly unpleasant shoot, all pruny skin from being immersed all day long, but not as sorry as you do for the audience.